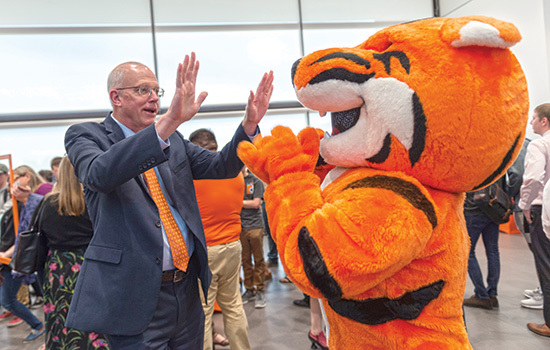 RIT President David Munson introduced a stronger narrative for the university that “leverages the power of technology, the arts and design for the greater good” during a campus-wide brand kickoff on Sept. 27. You ever wonder what people think about you? First impressions. Lasting impressions. Your brand is a summary of both. Here at RIT, we have refreshed our brand to reflect how far we’ve come and where we intend to go. For our university, branding answers a fundamental question: Who and what is RIT? Having an identifiable brand will help distinguish our university from others, in the minds of prospective students and parents, colleagues at other universities, funding agencies, government officials and the general population. Our brand works by forming emotional connections from the very first interaction—a billboard in downtown Rochester, a conversation at the Imagine RIT festival, an inquiry from a potential student about NTID or an interaction with an RIT alumna in Silicon Valley. These interactions accumulate and shape the way people think and feel about our university. Our new brand is derived from rigorous qualitative and quantitative research that includes feedback from target audiences —prospective students, corporate and community partners, school counselors and academic peers—as well as our own students, faculty, staff and alumni. We have constructed a unified RIT story that we can now collectively share with the rest of the world. Our brand will focus on a creative community and innovation in every discipline. Elements of the new brand can be found in this magazine, with stories focused on technology, the arts and design as well as our new logo. Look for more enhancements in upcoming editions as we continue to hone our storytelling. So, what is our story? Our kaleidoscope of curious minds uncovers ingenious ways to move the world forward! Let’s work together to solidify our position as a creative and innovative powerhouse. We have no interest in the status quo. Let me reinforce that RIT is an outstanding university and is only going to move upward. Collectively, we can do a better job of sharing with the rest of the world what truly makes us better, different and special. When everyone at RIT participates in a unified storytelling approach, our message will carry farther and more quickly. You, too, are our brand champions. And now we need all of you to be RIT’s brand ambassadors. We need you to help tell our story to the world. Learn it, love it, live it! And I will be right there with you. Because at RIT, we’re always on to something amazing!